Discussion in 'Pesticide & Herbicide Application' started by Trey Kornegay, Jan 27, 2019. 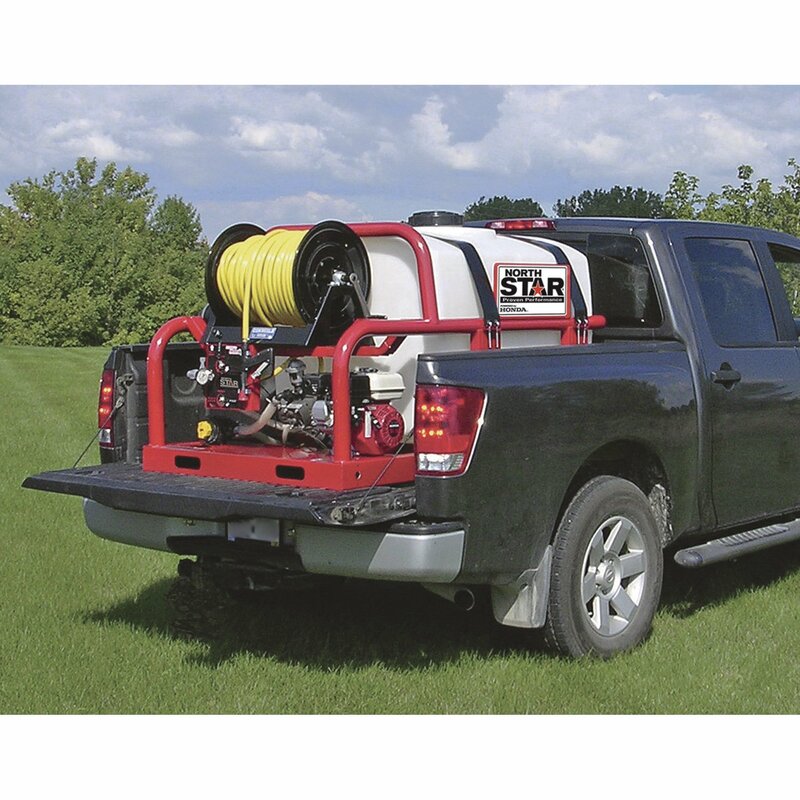 I have outgrown and mower mounted tank sprayer and looking to transition to a skid mounted sprayer. I am looking into a 100 to 150 gallon unit. Due to weight and space restrictions. Two manufactures I have in mind are Reddick Equipment which is local to me and GNC Industries. I have a few questions im trying to get cleared up before I purchase one. 1. Roller ,Piston or Diapram Pump? I have used roller pumps in the past and they seam to be more reliable. 2. Hose Size 3/8 or 1/2? Im looking at running a 150 ft reel with 150 spare hose in the bed. Is there a big flow/pressure difference between the two? I like roller pumps personally, but always buy the silvercast. Simple and little or no maintenance. Probably need 1/2" hose with a roller. They are made more for volume, than pressure. Diaphragm and piston pumps are good too. Really just personal preference. You can run 400' of 3/8 hose on a reel made for 300 ft of 1/2". Get a 12v hose reel. I don't use a skid as much as I used too, but I pretty much always go with the same setup. I've had 5 or 6 skid sprayer and 4 have been the same. 200 gallon tank, Honda engine with hypro silvercast 8 roller pump, 300 ft 1/2" hose, teejet gun. I can run pre, post, insecticide, fert. I don't do trees. This works for me. You've got to figure out what works for you. So upon further research of pumps I’m leaning more towards either roller or possibly a centrifugal pump simply for there simplicity and reliability. I don’t like how a lot of piston pumps run off belts. What kind of gpa are you running with your rigs? Ones of ran in the past have put out about 100 gals a acre at 20 psi? I apply at about 100 GPA. My pressure will be set at about 125 psi. That is about 95-100 psi when trigger is pulled. I think you should bite the bullet and buy quality equipment. Costs more, but it will serve you well. Like the GNC with piston pump. Or the diaphragm pump--both are direct drive--no belts needed. Are you planning to dissolve bags of urea and potash for your tank solution? The roller pump costs less, but you need to replace rollers and they cannot handle grit nor wettable powders. If you run it dry, the rollers burn up. Two 150 foot lengths of half-inch hose--not sure how that would work. The half-inch 300' hose is better as you can get about 50 percent more pressure and flow at the gun, which is at the end of 300 feet of hose. 200 gal tank model suits most needs. The 100 gallon model will force you to refill half-way through your day. Not good, once you have more than 100 customers. The space saver tank is better because it leaves room for your spreader; hose goes out to the side. With other models, you will probably need to rotate the reel so the hose pays out to the side--and not out the back over the tailgate. The units Reddick Equipment make are acutually more expensive. As of now I’m not planing to do any fertilizing with the unit. All The gnc models i have looked at are run by a belt even the 200 space saver. I have a rig with a Centrifugal Pump. Is there anything wrong with those. I know in the past we were able to run 100gpa at 20 psi which put the motor just above idle? I am not sure I understand. I do not see how you can get 100 gals per acre (2.3 gals per thousand) with only 20 pounds pressure. I needed about 100 pounds pressure do this. 300' half-inch hose. 6 gpm Hypro diaphragm pump. 208 cc 6 hp Briggs motor. How many gallons per minute would your setup produce? Look at the pump claims with a careful eye. Commonly they claim high pressure and high gallons output--actually--you get either high pressure or high output--but not both at once. Here is another good sprayer. Gregson Clark has the best quality and guarantee. Most pumps are direct drive--no belts. Diaphragm pumps are the most suited to the lawn care biz. Regardless of the company, do it yourself--or--you may need to have them rotate the reel so that it pays out to the side. Maybe bolt the reel to the bed or fender. When I switched to a one-ton truck and got a bigger tank--I had to use a hacksaw and cut my sprayer in half. Then mount the pump part sideways so the reel paid the hose out to the side. See avatar. Measure carefully so you can be sure your spreader will fit in the bed (mine did not at first). Think about buying a smaller 50 pound spreader--like the Earthway 2150. Takes up less space. And you will seldom need to fill with a full 50 pound bag. Here is the hose flow and pressure loss data. Dultemeier also make good sprayers.